An Ancient Gateway as they appear on Garden worlds. The Outpost is a premade structure that is accessed through the Ancient Gateways present on the starter planet or other lush planets. The outpost is populated by NPCs of all races and allows the player to access several shops and Quest NPCs. 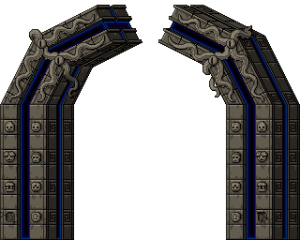 Players will first arrive at an unusable ancient gateway, where upon heading right will arrive at the main area of the outpost. Once at the outpost, players can register the 2 Stop Teleshop Teleporter bookmark. After doing that, they can teleport straight there from their ship or any other teleporter. There are a number of different areas and stores in the outpost. Infinity Express is located in front of the outpost, and Penguin Bay is located out back. There is a cafe-type area with an outpost fridge and Chic Cooking Table as well as the EASEL machine for creating custom signs. The Outpost also contains a bathroom, a security room, and a loading bay. Players can purchase a rotating assortment of themed furniture from Frögg Furnishing as well as vehicles from the Shipyard Captain on the outskirts past Penguin Bay. Even further past the Penguin Bay, there is a shop called Treasured Trophies which sells rare items. Below to the left is the Penguin Weapon Shop, which offers upgrades to rare weapons. To the right and further down is the Beakeasy, which will allow one to hire penguin mercenaries as crew members. Within the Beakeasy lies an arcade machine loaded with Mazebound64. These shops all start out closed (with the exception of Infinity Express and the Shipyard Captain) but will open up as the player progresses through the main quest. Frögg Furnishing, 2 Stop Teleshop, and Terramart will all open after The Erchius Mining Facility is completed. Ursa Miner will be closed until The Lost Teddy is completed. The Beakeasy penguin saloon will open after Dreadwing the Penguin is completed; Biggy's Reputable Weaponry will appear once Grand Pagoda Library has been completed, though it will only start offering its services once Shockhopper Mk I has been destroyed. The quest to defeat Shockhopper Mk I and stations to outfit mech vehicles are located underground, just above the Beakeasy. After clearing the Ceremonial Hunting Caverns, the sign shop, EASEL, and the fake ship license shop, Penguin Bay, will open for business. Clearing the Grand Pagoda Library, in addition to causing Biggy's Reputable Weaponry to appear, will also cause Treasured Trophies to arrive at the Outpost to offer its goods. Finally, the Mazebound64 arcade machine will become playable once the Great Sovereign Temple has been cleared. Once a shop is opened, it is open for each player in that universe. If a player does the quest to open Ursa Miner with a specific player, it will be open for everyone who visits that universe's Outpost. The only way to reverse this is to use /resetuniverseflags while in admin mode to reset the Outpost to its initial state. Penguin Bay, while open, will not sell anything. Another exception is the Beakeasy, which will always require you to complete Dreadwing the Penguin before opening its doors. As well, Ursa Miner's stock, once the shop is open, is not affected by Outpost progress - rather, the selection of items offered to each character depends on how far that particular character has progressed through the main story quests. Any items placed in storage containers at the outpost will disappear after returning to your ship. All containers refresh upon loading the world. The Tech Lab is a room at the center of the Outpost where tech cards can be exchanged to acquire techs. After a tech is unlocked, the player may return to the Outpost at any time to change their active tech. Initially the scientist here recruits the player to test experimental tech at an obstacle course. There are three separate courses, unlocked after giving the scientist Copper Bars, Silver Bars and Gold Bars that he requests. Completing each course will open the quest for the next and add a new base tech to the player's available selection. After all three courses have been completed the Tech Console dispenser will power online, enabling players to purchase their own placeable console for managing techs. These consoles function the same as the outpost terminal, but will be destroyed when picked back up. Beneath the outpost mercenary penguins do shady business. You'll find the Beakeasy penguin bar underground. There players can get side quests to defeat Dreadwing and Shockhopper Mk I. Also, players can play Mazebound64 in the Beakeasy once the Great Sovereign Temple has been cleared. After completing Dreadwing the Penguin, the bar will fill with penguin mercenaries, and the bartender will offer dubloons to the player at an exchange rate of 3 diamonds each. Once the other stall becomes occupied (after completing the Grand Pagoda Library mission), the player can similarly receive the Penguin Weaponry Testing Site quest to unlock the Penguin Weapon Shop. In the same passage underground as the Beakeasy there's a workshop for outfitting mech vehicles and assembling parts. The penguin scientist here, Dr. Akaggy gives a variety of mech quests after player have repaired their ship beginning with Test Drive to unlock the ability to pilot mechs. There is a Mech Part Crafting Table and Mech Assembly Station inside the workshop, available for players to access at anytime. 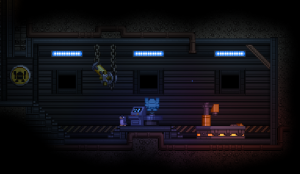 This workshop is the main hub for crafting mech components and swapping out pieces in the player mech. Completing the quest Penguin Weaponry Testing Site here will unlock the Penguin Weapon Shop - also located below the Outpost. The name "Beakeasy" refers to "speakeasy" which were illegal bars in the 1920's. Inside the asset files are pictures and graphics of the outpost in the area where planet horizons are stored, with a large graphic for the outpost, but they're unused and serve no purpose. The music that plays in the outpost is also the same music that plays during the introduction mission. 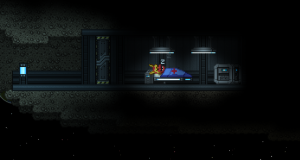 There's a small hidden room underneath the asteroid the outpost is built on. Inside it, the Insidious Mask can be found. The room can be accessed by rolling left off the outpost edge using the Spike Sphere or otherwise with Grappling Hooks. Prior to Cheerful Giraffe, the player would have to complete a quest for the mask, called The Under Side. This page was last modified on 5 January 2019, at 20:09.